After December, I think September is my favourite month, the month that doesn't really know if it's Summer or Autumn, today we hit the highest recorded temperature in September for 150 years so it's difficult to start thinking about Autumn and the chill that it brings. Most of the leaves ares till firmly attached to their branches and we are still harvesting outdoor tomatoes. The pool has been put away for another year though, although I'm regretting this today! 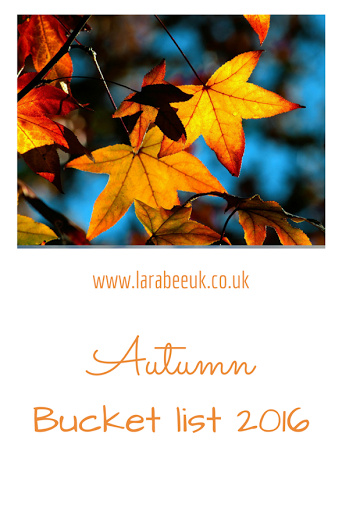 We are still working on our Summer Bucket List so for the next few weeks we'll continue to work on that but also tick off some of our Autumn items as the evenings draw in after the hazy days of Summer and we find ourselves experiencing both seasons in a day. The Hubs has just ordered a Gas BBQ so we're hoping to still cook in the garden when we can and the firepit arrived last week which means that we can still sit out and enjoy the evenings. We are hoping to head off camping next weekend if the weather is kind to us, apparently our tent wouldn't be too good in wind and rain so we need a nice dry weekend for that to happen. 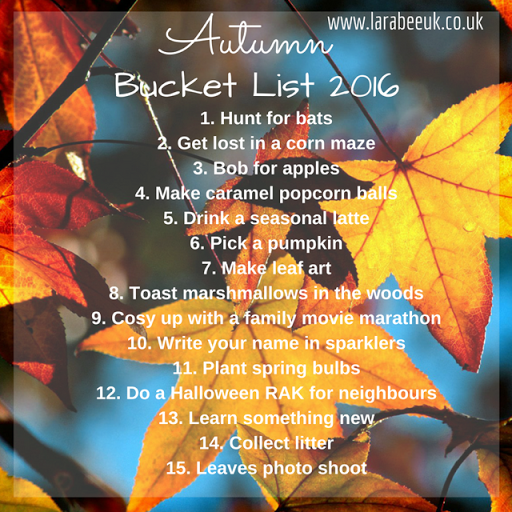 I've not yet decided if we'll have a Halloween one for this year so I have included a couple of Halloween activities on here.